Thu., May 7, 2015, 9:34 a.m. 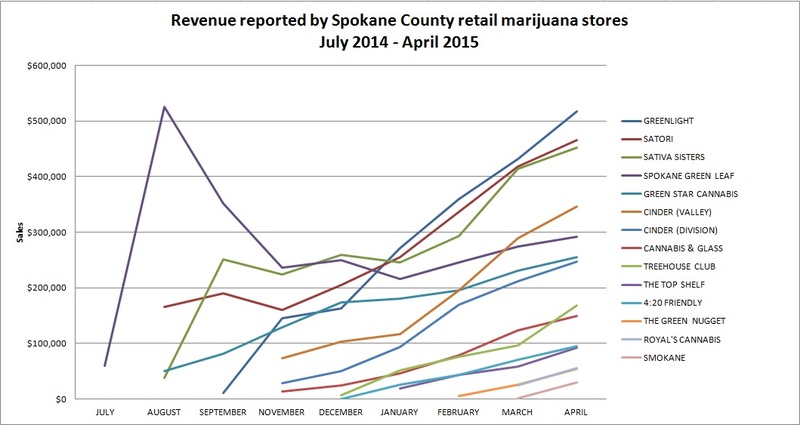 This blog post has been updated with April sales numbers from Spokane County marijuana producers and processors. In a month that saw state legislators vote to blend medical and recreational marijuana laws, Spokane County retailers reported sales of more than $3 million, the largest monthly total since sales began last summer. The 4/20 effect was noticeable for state recreational marijuana retailers, with the weekend of April 20th seeing the highest sales to date, according to statistics from the Washington Liquor Control Board (which will be renamed the Washington Liquor and Cannabis Board under new state laws governing recreational and medical pot sales). State shops set a record on Friday, April 17, selling $1.76 million worth of legal marijuana. But the counterculture holiday wasn't the game-changing day for recreational sales some made it out to be - this past Friday, shops sold $1.83 million worth of weed. If anything, the statistics show weekends are more important to cannabis users than pre-ordained celebrations. In Spokane County, retailer Greenlight continued its pace of outselling all other shops authorized under Initiative-502, reaching a half million dollars in sales for the first time since opening in September. Greenlight's sales total of $517,032 fell just shy of Spokane Green Leaf's record haul of $524,579 in August. 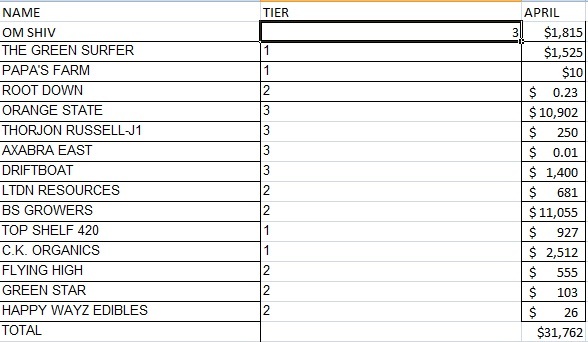 Only three stores were selling legal marijuana when Green Leaf posted that total; Greenlight is competing against 13 other stores. If Greenlight's trend continues, it will break that record in May. No new stores reported sales in April, but overall revenues still saw an increase of about 21 percent over March. Statewide, producers have been posting sales numbers much lower than retailers after concerns surfaced in January about a glut of product in the market. In Spokane County, growers struggled to post $31,762 in sales last month. Producers posted their highest sales total in November, with roughly $1.9 million sold statewide. Processing continues to be the most popular part of the marijuana industry in Spokane County, based on the number of businesses reporting sales figures to the Washington Liquor Control Board. Thirty-nine processing businesses in Spokane County reported total sales of $2.2 million in April, with Grow Op Farms in Spokane Valley accounting for more than a quarter of those numbers at almost $950,000 in sales.